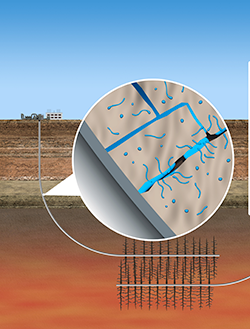 When geothermal wells are made using PNNL-developed self-healing cement, cracks and breaks in the well can heal automatically. This technology has the potential to eliminate excavation, repair, and replacement costs associated with cracked cement wells. Enlarge Image. With an average life span of 30-40 years, the cement around geothermal production wells eventually cracks over time. Because wells with cracked cement are vulnerable to leakage, reduced strength, and corrosion, it's important to repair them in a timely fashion. However, repairs can easily top $1.5 million dollars; the cost of new materials, excavation, installation, and halting power production adds up fast. Researchers at PNNL developed cement that can heal itself when cracks occur. Using self-healing cement for geothermal wells would save geothermal plants millions of dollars and would reduce the amount of downtime necessary for repairs. Super to the Power of Three. PNNL chemist Carlos Fernandez and his team discovered that by adding a strong and flexible and powerful ingredient, called polymers, they could create self-healing cement. Naturally found in the human body, plant structures, and more, these large, chain-like molecules work to hold substances together. The team discovered by mixing in 5 to 20 percent of man-made polymers into typical cement before it is poured and cured, the cement can repair itself when cracks occur. PNNL’s research team has successfully proven this cement can repair itself in a few days, and they predict it has the potential to heal itself in just a matter of hours. Just as impressive, is the cement’s projected ability for continuous self-healing, meaning it can repair itself many times over and maintain the rheological and mechanical properties necessary for geothermal wells. Sponsor: This work is part of a collaborative project between PNNL, Brookhaven National Laboratory, and National Energy Technology Laboratory funded by DOE's Geothermal Technology Office. In one sentence: Researchers at PNNL developed cement that can heal itself when cracks occur. In 76 characters: Researchers at PNNL developed cement that can heal itself when cracks occur.